Neurotoxicology. 2007 Mar;28(2):434-40. Epub 2006 Aug 1. 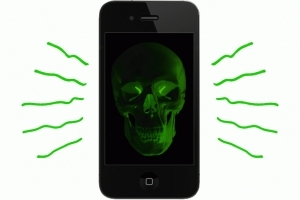 Abdel-Rassoul G, El-Fateh OA, Salem MA, Michael A, Farahat F, El-Batanouny M, Salem E.
We all have repeatedly been told of the dangers of talking on our cell phones and the concerns of the possible link to brain cancer from holding the devices up to our ear. Now they are going further than that by telling us we should not carry them in our pockets. They point out you need to read the fine print that comes with your cell phone. Among people living closer than 300 m away from the base station, a French study found an increased incidence for tiredness (within 300m), for headache, sleep disturbance, discomfort, etc (200 m). For irritability, depression, loss of memory, dizziness, libido decrease, etc (100 m). Women significantly more often than men complained of headache, nausea, loss of appetite, sleep disturbance, depression, discomfort and visual perturbations. This first study on symptoms experienced by people living in vicinity of base stations shows that, in view of radioprotection, minimal distance of people from cellular phone base stations should not be < 300 m.
A German study found a threefold higher frequency of cancer among people living in the vicinity (400 m) of a GSM base station compared to people living further away from the antenna. The risk for mammary cancer was 3,4 times greater and the average age of contracting this disease was considerably lower, 50,8 years than in the control group (69,9 years). The frequency increased also the longer people had been exposed to the radiation. The study covered a ten year long period (1994-2004), starting the year after the installation of the base station. Before the installation of the base station, there was no difference in cancer incidence between people living in the vicinity of the (future) base station and the control area. There exsists ample and uneqiuvocal evidence today that microwave radiation damages DNA. It has also been established beyond doubt in experimental studies that DNA damage increases cancer risk. This study adds to several others indicating that the DNA damage from microwaves brings about a considerable increase of cancer risk among people exposed to the radiation. 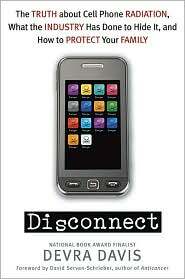 A new book titled “Disconnect: The Truth about Cell Phone Radiation, What the Industry Has Done to Hide It, and How to Protect Your Family” by toxicologist and epidemiologist Devra Davis connects cell phones with a variety of health problems. Salon recently talked to the National Book Award finalist for “When Smoke Ran Like Water.” The author, who has spoken before Congress on the effects of smoking on cancer, uses some relatively recent studies that have tied cell phone use to rises in brain damage, cheek cancer, and malfunctioning sperm as the basis for her claims. She also points to a new small-print warning on cell phone packaging that says phones should be kept at least one-inch from the ear. And she uses the fact that many insurance companies refuse to insure cell phone companies against health-related claims as proof of her assertions as well. She is not alone in her claims of cell phone dangers, with the World Health Organization indicating that more than 10 years of use could cause brain cancer. The problem with that is proof, considering most of us haven’t been using phones for 10 years yet. However, there’s nothing wrong with a little caution, just in case. Surprisingly she doesn’t recommend throwing out your phone. She does recommend you use a headset, text more, and keep your phone in a purse or other bag, instead of in your pocket. We have five recommendations of our own.